I remember assigning Robert Frost’s “After Apple Picking,” along with “Birches” and “Mending Wall” to my first-ever college class. I was twenty-two, and at least one of the seniors in the class was older than I was. A clerical error had given me a class of thirty instead of twenty, and we were assigned a narrow, windowless room on the second floor of the library. The heaters clanged on in August and the noise of campus construction somehow reverberated in that room. I loved being a newly-minted teacher, choosing readings and building a course that I wanted to teach (and take). I loved practicing my students’ names so that they would feel comfortable in class (one Thai last name was a real tongue twister! ), and I loved watching their ideas spill onto the chalkboard. There’s no better job than being a tour guide through literature. I chose to teach Frost because we’re in New England, after all, and he’s THE New England poet, and I encouraged my students to get out of the city and see the beautiful blend of colors in the trees. 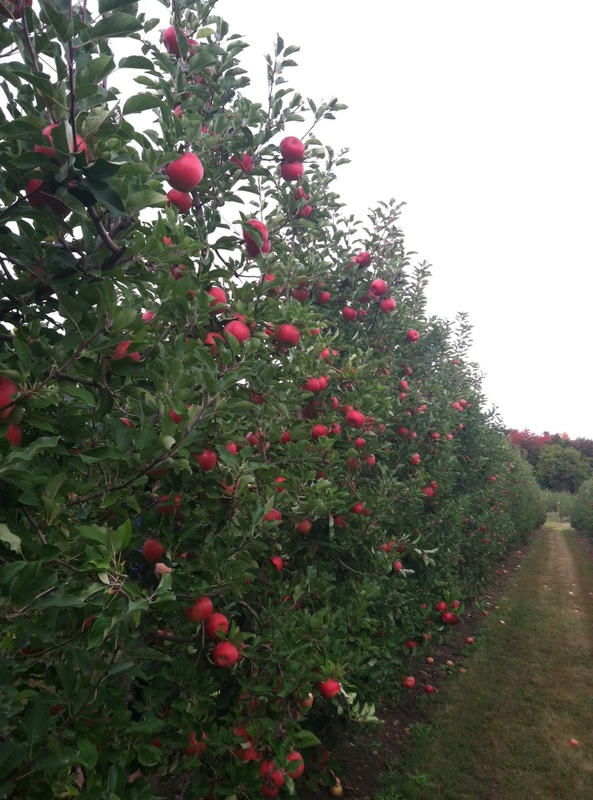 I’ve gone apple picking each fall with Mr. O since we started dating, and there’s nothing like the blue sky and the fiery trees and the red, red rows of apples. This was one of the poems we read in my poetry class in college. I like Frost! Me too! Such a wide range he has! What a lovely post! I love reading about your teaching experience here (and how brave, to be teaching at 22!). You’ve asked me which poets I’ve enjoyed in the past, and Robert Frost was the first person that came to mind. I was afraid of sounding cliched 😉 but I do remember his poems well from school and from having to recite them in front of my classmates in English class. I wasn’t brave, really — all first-year PhD students had to teach; I just had the extra ten students, which was, I suppose, a trial by fire. I LOVE reading your thoughts on teaching. It’s extremely rare and refreshing to see someone who loves the profession. I think it’s one of the greatest jobs you can have and most people who do it seem to loathe it. You’re doing it for the right reasons and it warms my heart. Honestly. You sound like every teacher that’s ever inspired me, because you’re inspired as well. Oh, I thought you were still doing it. I took a leave of absence from my PhD program (and, consequently, teaching) after my son was born, and then that had to be extended, for various boring reasons. I’m on the market for jobs at independent high schools. If only Canadian schools would accept lowly American teachers. My husband spent a year in Vancouver and we would both love to end up in Canada someday.